Thousands of Australians gathered in Sydney this past Sunday, September 13, to protest a set of laws stifling local nightlife. The rally, which was organized by resistance movement and collective Reclaim The Streets, was the most successful demonstration against the so-called “lockout laws” since they came into effect in February 2014. The measures restrict clubs to a designated central area in the city and Kings Cross excluding the Star City Casino, forbid entry and re-entry into venues after 1:30 a.m., prohibit alcohol to be served after 3 a.m. and restrict the amount and type of spirits on offer after midnight. As a result, many nightclubs have shut following a decrease in profits, pressure has mounted on small underground promoters to bring venues more income and violence has risen per capita (despite reports to the contrary). The lockout laws have met vehement criticism from the local dance music community and beyond. In addition to crippling nightlife culture and industry, the measures have disturbed neighbourhoods outside the zone, particularly the historically gay-friendly Newtown district, where a transwoman was bashed by strangers in June. Locals also bemoan a convenient gap in the zone effected by the restrictions to accommodate the construction of an expensive casino, hotel and apartment complex funded by the famously wealthy Packer family. 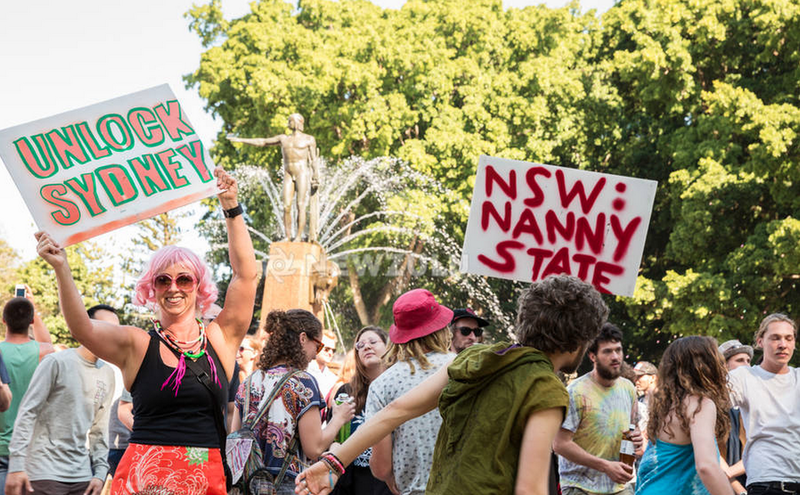 While previous attempts within the dance music community to organise activism against the lockout laws have dissolved into what one local DJ called “rather dismal failures,” the Reclaim the Streets rally combined the efforts of various social groups and thus garnered serious groundswell behind the issue for the first time. Yesterday, the day after the rally, we reached out to local DJs, promoters and protest organisers—all of whom were reeling from the news that Australia’s prime minister Tony Abbott was ousted by his own Liberal party, which also broke on Monday—to get on-the-ground reports from Sydney. “The event itself was great. I played on a mobile sound system, dragged by a number of ‘slaves’ about 2 kilometres from Hyde Park in the centre of the city to Taylor Square via Kings Cross’s famous Coca-Cola sign. At Taylor Square, all the sound systems converged for a rather messy soundclash, but vibes were good. The police were pretty relaxed; I saw a little derision but no aggression. There was a broad cross section of people who were mainly focussed on the lockouts and the effects they’re having on Sydney’s cultural life. “Reclaim the Streets was important because it served as a place where many differing tribes were fighting for one cause. The message was unified under, but not limited to, fighting the lockout laws, which have totally crippled nightlife and the music scenes in Sydney. As a performer and promoter I have run out of viable spaces to hold events. It completely slows down any development that can happen within a music scene. There’s so much talent within Sydney ready to burst, but there’s an obvious lack of support. Even with all the venues closing, we still have crews working to fight it. The many sound systems displayed at Reclaim the Streets represented various DIY crews within Sydney covering dub, electro, house, techno and drum ‘n’ bass. The protest was peaceful, yet there was a ridiculous number of police.That was pretty typical Sydney. Nanny State. “Good people who have worked hard to make our community greater have been unfairly punished by the lockout laws. Venues and businesses all over Sydney are closing as direct result. Taxi drivers, bar staff and other night workers have lost work hours. Promoters are struggling even more to find appropriate venues for events and parties, and the scene is stunted as a consequence. A broader community is being affected in hugely detrimental ways. We want our parties to be the best they can be, and there’s an intense amount of potential here, but there’s also the constant feeling that you’re fighting against a government that doesn’t care about your community or the arts in general. Perhaps the worst part is that our government’s lockout laws don’t address the real problem of alcohol-related violence in our society and does not provide any long-term solutions to this longstanding and deeply rooted problem. Mad Racket will host Fred P on October 31 and Phile will perform in support of Rødhåd at the House of Mince x Charades party in Sydney on November 27. Cover photo via NewZulu.